White House press secretary Sean Spicer said he thought that senior adviser Kellyanne Conway was joking when she mentioned microwaves as devices that could have been used to spy on Donald Trump during the election, but that the president's underlying claims about being wiretapped by former President Barack Obama were serious. "I think he's extremely confident" that the Justice Department will provide the evidence evidence to bolster Trump's claims, Spicer said during Tuesday's briefing with reporters. "I think there is significant reporting about surveillance techniques that have existed throughout the 2016 election." The House Intelligence Committee has asked the Department of Justice to hand over material that might support Trump's allegations that Obama ordered Trump Tower wiretapped. On Monday, the Justice Department sought and received an extension until March 20 to respond to the committee's request – the date its first public hearing on Russia's efforts to meddle in last year's presidential election is scheduled. 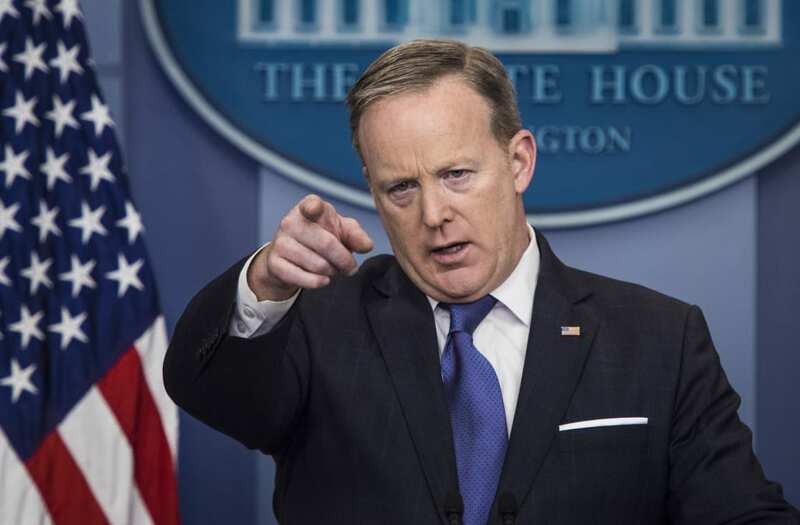 "I'll leave it to them to issue their report, but I think he feels very confident that what will ultimately come of this will vindicate" Trump, Spicer said Tuesday. "I'm just going to say the president has tweeted about this. He's pretty clear he believes there was surveillance conducted during the 2016 election," Spicer said. U.S. President Donald Trump reacts after delivering remarks during a visit to the Central Intelligence Agency (CIA) in Langley, Virginia U.S., January 21, 2017. U.S. President Donald Trump waves as he leaves the Central Intelligence Agency (CIA) headquarters after delivering remarks during a visit in Langley, Virginia U.S., January 21, 2017. U.S. President Donald Trump delivers remarks during a visit to the Central Intelligence Agency (CIA) in Langley, Virginia U.S. January 21, 2017. U.S. President Donald Trump speaks at the CIA Headquarters in Langley, Virginia, U.S., on Saturday, Jan. 21, 2017. Trump assured employees at the CIA of his strong support and said he would unleash them to defeat Islamic terrorists after previous presidents had held the intelligence community back during the nation's 16-year-old war with extremists. U.S. President Donald Trump delivers remarks during a visit to the Central Intelligence Agency (CIA) in Langley, Virginia U.S., January 21, 2017. U.S. But he did walk back Conway's remark to the Bergen Record in New Jersey that "microwaves that turn into cameras" could have been used to surveil Trump's election headquarters. "I think there's pretty sound evidence that the microwave is not a sound way of surveilling someone," Spicer said. "I think that has been cleaned up. It was made in jest, so I think we can put that to rest." But Conway had been trying to argue that Trump's initial claim – "that President Obama was tapping [his] phones" – was not meant to be taken as a literal accusation of wiretapping, but as a broader accusation of surveillance. "What I can say is there are many ways to surveil each other," Conway said. "You can surveil someone through their phones, certainly through their television sets – any number of ways." Spicer offered his take on the same point on Monday. "I think recognizing that he doesn't really think that President Obama went up and tapped his phone personally, I think," Spicer said. "The president was very clear in his tweet that it was, you know, 'wiretapping,'" Spicer said, using his fingers to make air quotes. "That spans a whole host of surveillance types of options." Conway herself said Monday she hadn't intended to be taken literally. "I'm not Inspector Gadget," she said Monday on CNN. "I don't believe people are using the microwave to spy on the Trump campaign."